Screen-based viewing has become the norm for many. 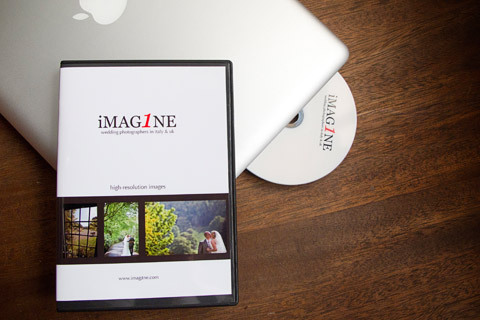 Having possession of your wedding image files enables you to view and share them on computers/iPads etc. at their highest quality and you are able to accept responsibility for their safe-keeping. You can also print your own photographs - either at home or by using a lab. When you purchase the image files, you receive them as high-resolution JPG files. These are fully-worked photographs. Waiting for the post to arrive with a copy of them on a disc is just too slow for most. Instead, you will be able to download the files securely to your own computer. Even if they take an entire evening (or night!) to download, at least you can enjoy them, make prints and share them with your friends and family days quicker than would have been the case previously. Don't worry if your internet connection makes this impossible, upon request we'll still post a DVD out to you instead. My Parents' Albums are a beautiful momento of the wedding. Once more I've sourced what I believe are the best quality ones made anywhere. They're hand-constructed and contain prints sized at 7"x5". Replica album pages are an option in smaller sizes like this, but sometimes these are often a little too small to appreciate fully. 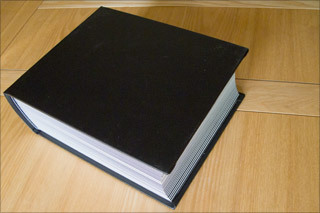 I believe that the original wedding album truly deserves to be duplicated rather than reduced in size; therefore, I recommend that clients (or their parents) select their favourite images from the wedding and I make the albums with one image per page as you can see here. 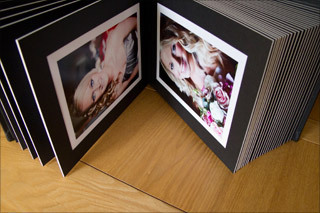 The images look fantastic in the black linen mat with a small amount of white space. Portrait-orientated images are rotated rather than reduced in size. Personal 'Thank you' cards are a hugely popular choice, solving the issue of the formal 'thank you' with something a little more individual. 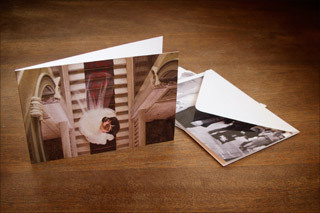 The cards are 148mm x 105mm, have a high-quality, glossy finish & include envelopes. They can either be 'landscape or 'portrait' orientations. If there's anything that you'd like to purchase that you haven't seen mentioned, please just drop me a line. I'll happily provide you with a quote.